“Coneixem l’educació viària“, de la colección “El bosc de colors” de Barcanova, es el título del pequeño libro que ilustré el año pasado y que ahora os presento. 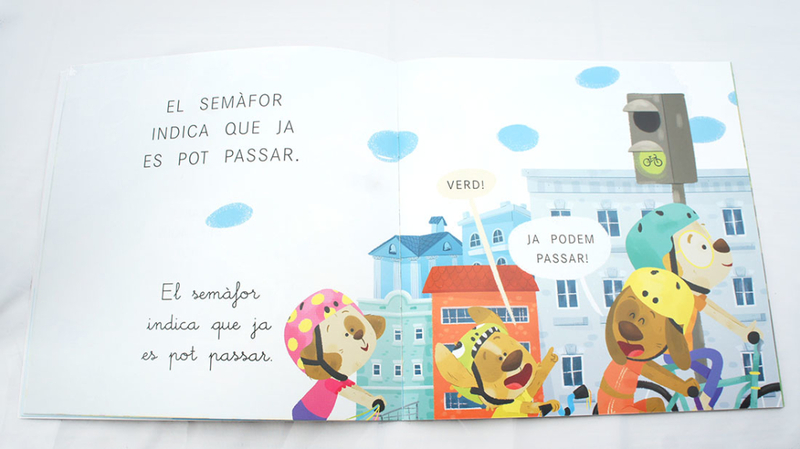 “Coneixem l’educació viària”, by Estel Baldó, Rosa Gil and Maria Soliva, published by Barcanova in catalan. 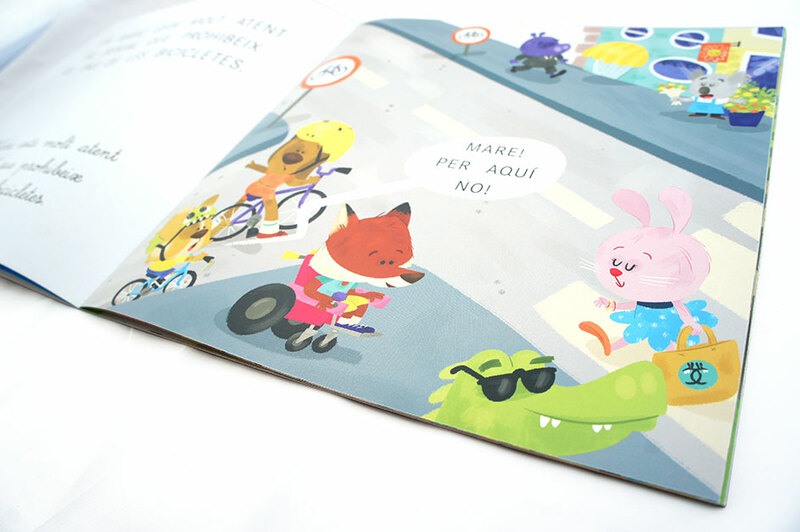 It is a small book I had the chance to illustrate last year and now I can show it to you all! Un libro educativo sobre seguridad vial… No es lo más seductor del mundo, lo reconozco jaja Pero el reto es hacer precisamente eso, que un niño se interese por semejante tema, hacérselo atractivo. Se optó por hacer una familia de perritos en un mundo animal. El hecho de hacer humanos acababa de ligar todo al mundo real y eso lo hacía más y más realista, y más y más denso. Por lo que algo de fantasía parecía aligerar un poco el conjunto. 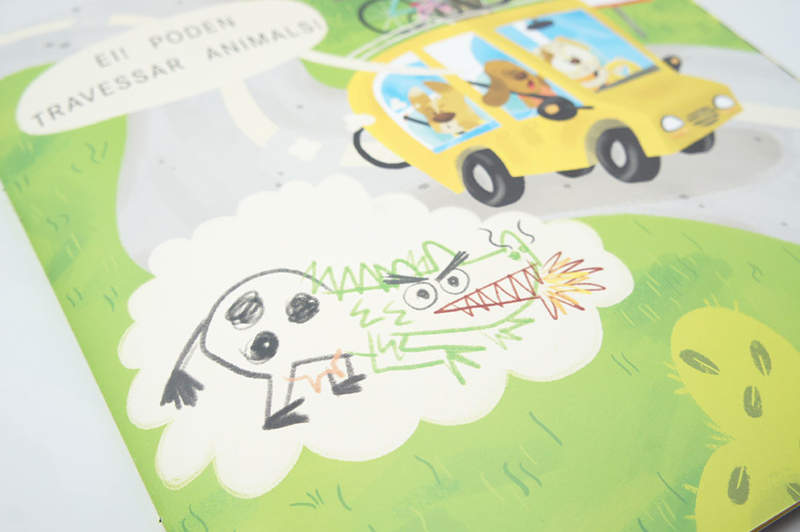 An educational book about Road-safety… It is not the most seductive subject, I accept…..hahaha But this was the real challenge, to make kids want to read about this issue…. to make it attractive to them. Phew..
We chose to make a dog family in an animal world. If the characters were human it would have make everything too realistic, and therefore more and more boring. That is why I chose to bring a pinch of fantasy in order to make the work lighter. Una de las características de la colección “El bosc de colors“, es que los textos aparecen en dos formatos: letra de palo y letra ligada, así como también incluyen bocadillos. Ésto deja menos espacio para las ilustraciones y es ahí donde hay que jugar con los blancos y las composiciones de las páginas. Así es como decidí afrontar el encargo, dando importancia al color y al blanco, jugando con los ritmos e intentando romper, en la medida de lo posible con la rigidez de la maqueta. One of the main features of this collection is that all texts are published on two forms: block letters and handwriting, as well as it also includes some text balloons. 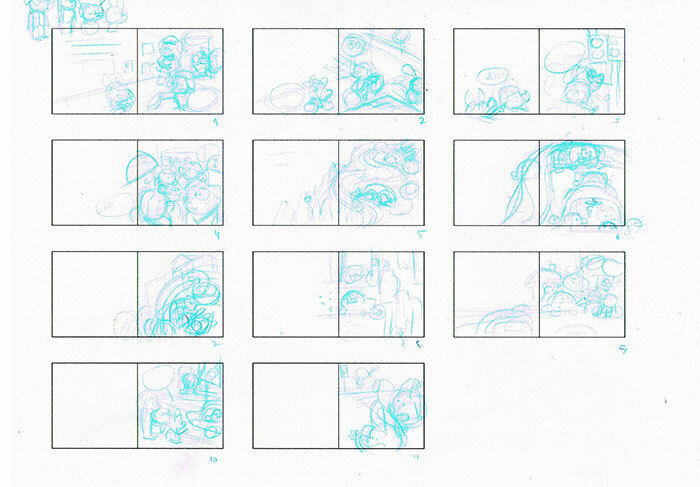 This reduces in fact the space for illustration and this is where I had to play with blanks and compositions on every spread. This is how I decided to approach the assignment, giving color and blanks the significance, playing with rythms and trying to break, as much as possible, the rigid outline of the book. Al tratarse de un tema educativo, también se optó por incluir todo tipo de personajes, rangos de edad y condiciones. Se trata al final de inculcar valores, deberes y respeto. 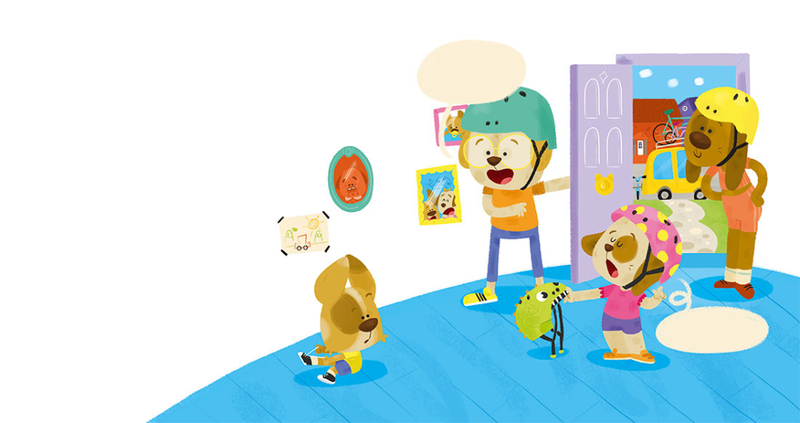 When it comes to an educational theme, we chose to include all kind of characters, age ranges and physical condition. It is all about instilling values, duties and respect. And this is the moment when I tell the truth… Drawing bikes is the most difficult thing to draw on earth! hahaha I never thought about that, but now…if you ever have to do it, I can only wish you luck….and tons of patience! Fue un trabajo divertido, que tuve que solapar con unos cuantos proyectos más, por lo que siempre el tiempo es un handicap…pero pese a todo, creo que hice una propuesta diferente para tratar la educación vial, que falta hace! It was a funny work to do, I had to overlap with other projects, so time is always a big handicap…but despite everything, I think I did a good different approach to a theme that needs so! Enjoy!! I will be back soon with more old news!!! See you soon!